Hidden among the clothing shops on the second level of JCube is Noodle Bar by Tokyo Latte, a smallish restaurant that combines the innovation and quality of Japanese with the comfort of old-fashioned European cuisine. Noodle Bar by Tokyo Latte wants to make casual dining a gastronomic experience where good food is enjoyed in the company of family and friends. The restaurant is designed with an open-air concept with wood-topped tables and chairs. As evidenced by its name, Noodle Bar by Tokyo Latte specializes in noodles. You can choose from 4 types of noodles to pair with your dish: ramen, cha soba, udon and Nissin (出前一丁 instant noodles). Old Fashioned Orange Crush [$4.30] is a refreshing drink made of orange juice, calpico, ginger ale, strawberry and mint. Not too sweet with a hint of mint. Grilled Seafood Tomato [$9.50, add $2 for upsize] is the signature at Noodle Bar by Tokyo Latte so I thought I will give it a try. My worry that the tomato soup will be too sour was unfounded. The slightly sweet tomato soup is made more flavorful with herbs and species. Inside, you can find grilled sea prawns, snapper, white clams, blue mussels, vegetables and mushrooms. 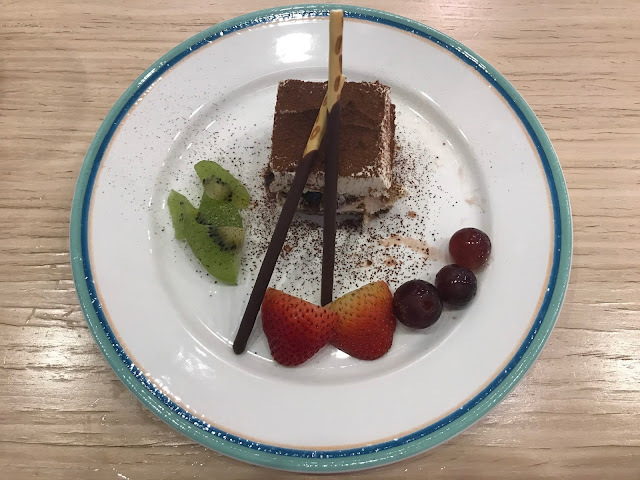 I have never been really very fond of tiramisu because tiramisu contains coffee and I am super sensitive to caffeine but the House Made Japanese Sweet Wine Cherry Tiramisu [$6.50] looked too tempting so I decided to take a chance with it. The Italian mascarpone, Kahlua, Japanese wine and cherries come together perfectly to become this soft and creamy dessert that has made me fall in love with tiramisu. 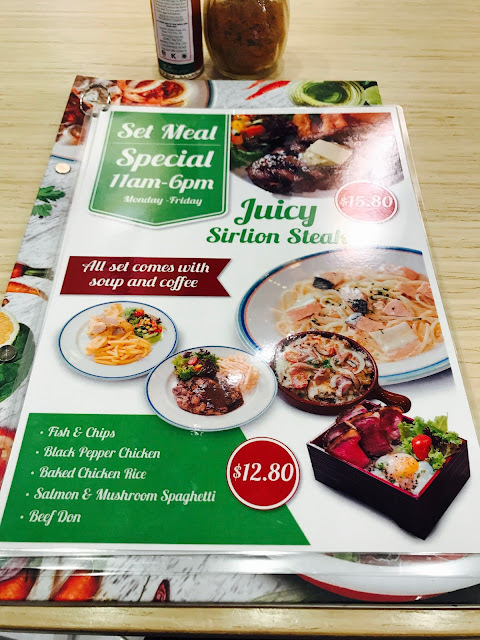 Noodle Bar by Tokyo Latte offers Set Meal Special from 11 am – 6 pm (Monday – Friday): Juicy Sirloin Steak [$15.80] or Fish & Chips/Black Pepper Chicken/Baked Chicken Rice/Salmon & Mushroom Spaghetti/Beef Don [$12.80] with soup and coffee. 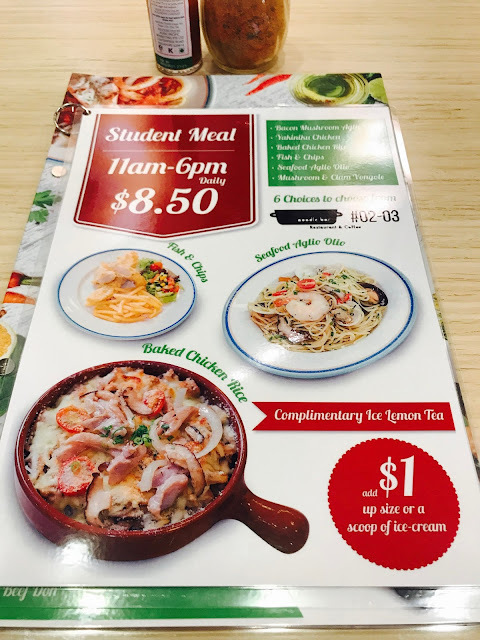 Students can enjoy the Student Meal from 11 am – 6 pm (Monday – Friday): Bacon Mushroom Aglio Olio/Yakinihu Chicken/Baked Chicken Rice/Fish & Chips/Seafood Aglio Olio/Mushroom & Clam Vongole [$8.50].